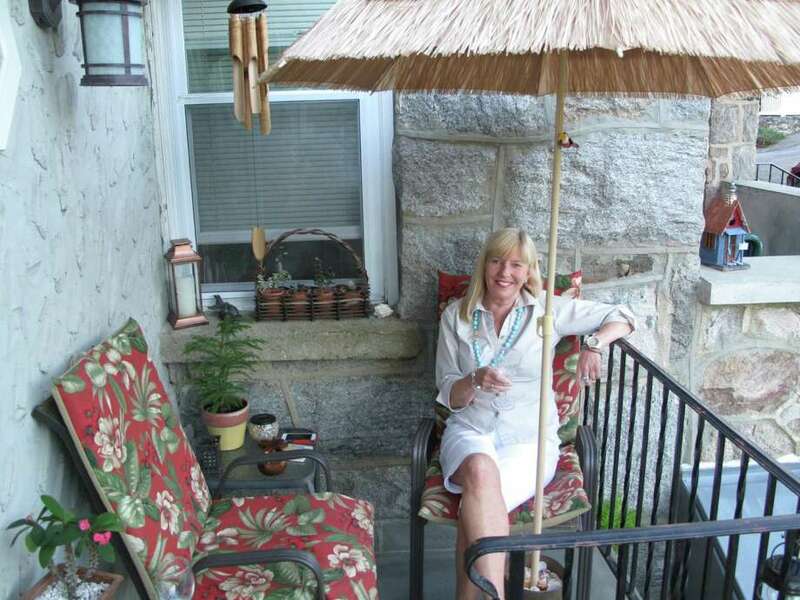 Terry Vanderheyden enjoys her tropical porch on Ledge Avenue. September 17, 2013. New Canaan, Conn. Most mornings and evenings you can find Terry Vanderheyden perched on the little slice of Florida that is her front porch on Ledge Avenue. Vanderheyden left Florida four years ago, but you wouldn't know it from her porch, which sports a thatched umbrella stuffed into a pail full of seashells, bamboo wind chimes that make it sound like you're ordering pina coladas from a beachfront tiki bar every time the wind blows, and this thin stick that pokes out from the doorway that tells you if it's going to rain. More on that later. "Porch" may even be a stretch. Vanderheyden has taken what is essentially a front stoop with a railing and stuffed two chairs with floral cushions, the umbrella, two small tables for holding drinks and solar-powered lamps. There's not much space, but a porch is what you make it. "This is my oasis, my refuge from a long day on my feet," Vanderheyden, who works for a company that helps plan people's residential moves, explained. She has her coffee with the newspaper every morning on the porch, and a glass of wine, usually Pinot Grigio, every evening. Even when it's raining. "Not pouring, and torrential, but, yeah, I sit under the umbrella." Vanderheyden is both an outsider and a native of New Canaan. She was born here and went to New Canaan High School. Her mother lives in the home the family built on White Oak Shade Road in 1951. Vanderheyden took off for sunny Florida with her husband in 1985. The pair opened The Monkey's Uncle, a bar two blocks from the beach in Ponte Vedra, on the northeast coast of Florida. She and her husband divorced, and Vanderheyden became a realtor. When the real estate market crashed in 2007 and 2008, Florida was one of the hardest hit states in the country. "I lost everything and sold what I had left and came back to New Canaan, mostly because my elderly parents were still here," she said. Her father died last year, but she has lunch every weekend with her mom on the table in her front yard, near her pink flamingos. "Gotta have pink flamingos," she said. Why? "Because they're fun!" New Canaan has changed somewhat, but not completely, as new residents have moved in over the years, Vanderheyden said. "I'm glad I lived there (Florida) for 25 years," she said. "It's different from New England, where people are a little more uptight, they don't talk to strangers. They don't have front porches in Ponte Vedra, but you open garage doors and sit in chairs in the driveway." Vanderheyden said she talks to all her neighbors coming and going when she's out on her porch. Now, the stick. It's called a Davis Hill weather stick. It's thin and about 18 inches long and is typically nailed to a windowsill or door frame. When it's going to rain, the stick itself droops down, and when it's good weather, it perks up. Vanderheyden said they're popular in the south, and according to a good deal of research on the Internet, also in Vermont. The wood is either balsam fir or southern hickory, and it's not entirely clear how they work, but it seems that they react to humidity to a large degree. There's no clear source for the name "Davis Hill" and the sticks are also called "Maine weather sticks" and "Vermont weather sticks" online. According to one Internet source, they were originally used as a low-tech barometer by Native Americans. Another piece of interest is the miniature pineapple tree Vanderheyden is growing. A year ago, she bought a pineapple from Walter Stewart's Market, and after lopping off the top and eating the pineapple, she stuck the top in a pot of dirt. The plant is doing well, and Vanderheyden said it will grow a small pineapple, like the ones from trees in the garden she kept in Florida. "Don't ever let anyone tell you you can't grow a pineapple in Connecticut," Vanderheyden said, with delight.